Te Econo Lodge City Star Hotel is located in Kangaroo Point, Brisbane just a short distance from the Brisbane CBD, Mount Olivet Hospital, Princess Alexandra Hospital, Mater Hospital, and Greenslopes Hospital. The property provides refurbished motel accommodation that is ideal for corporate business travellers, leisure holiday travellers, school groups, social groups and business groups. 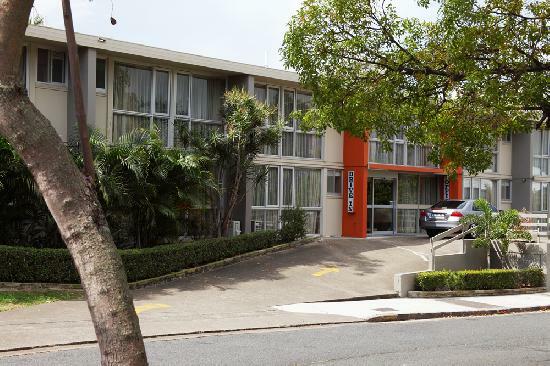 Close to the Brisbane CBD but without the hustle and bustle the Econo Lodge City Star Brisbane Hotel is situated opposite a large, pleasant inner city park offering picnic facilities and recreational grounds. Combining a range of hotel accommodation with a great location in Brisbane the Econo Lodge City Star is the perfect place to stay for both business and holiday travellers. This affordable property also has lots of great facilities including conference centre, direct internet access, faxing facilities, free car parking, guest laundry, room service, outdoor swimming pool, tour desk, baby cots available for families and daily housekeeping. With a bus stop to city, a 24 hour convenience store across the street and numerous restaurant & take away shops close by the Econo Lodge City Star Hotel is well positioned. It is also just a short walk to the Gabba, Kangaroo Point Cliffs, Southbank and Story Bridge. 2 Bedroom Hotel Suite : Sleeps up to 5 guests on 1 Queen Bed & 3 Single Beds. Double + 2 Singles Hotel Room : Sleeps up to 4 guests on 1 Double Bed & 2 Single Beds. Double + Single Hotel Room : Sleeps up to 3 guests on 1 Double Bed & 1 Single Bed. Double/Queen Hotel Room : Sleeps up to 2 guests on 1 Double Bed Or 1 Queen Bed. Executive Queen Hotel Room : Sleeps up to 2 guests on 1 Queen Bed.